Which U.S. President officially set aside the last Thursday of November as the national day for Thanksgiving? The annual Macy’s Thanksgiving Day Parade began in what year – 1911, 1920 or 1939? The average weight of a turkey purchased for Thanksgiving is how many pounds – 15, 17 or 19? The holiday shopping season traditionally begins on the day after Thanksgiving. What is the name of that day? 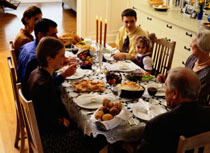 What percentage of Americans eat turkey on Thanksgiving Day – 71, 81 or 91 percent? And let’s ask one more question: Who can have a happier, healthier and truly thankful Thanksgiving by reading the articles in our Blog?